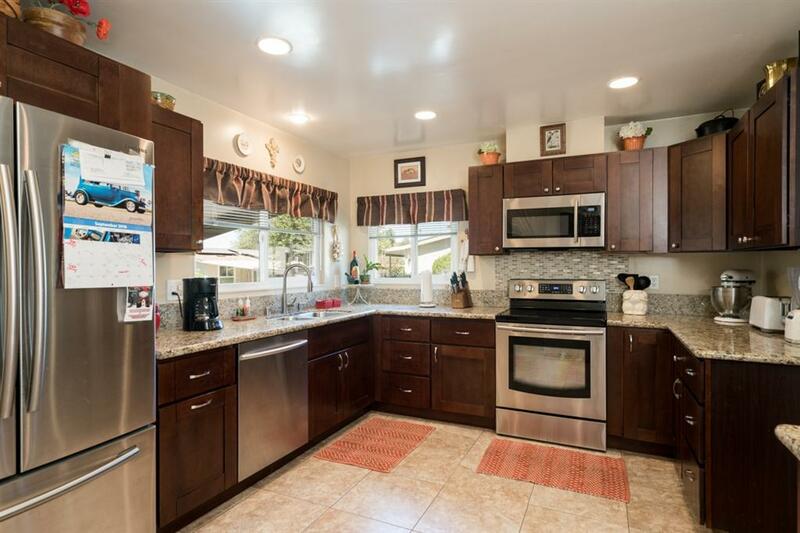 Gorgeous triple-wide home with New Kitchen, New Windows, & beautiful real wood flooring. The New roof plus Premium insulation makes this property a smart move. Add to that: ceiling fans throughout, trex-type decking, and a 12 ft. electric powered awning! It's a WOW! The yard is great too: privacy due to no homes built behind this one AND a drip system with timer for easy maintenance. Champagne Village is a sought-after gated community for active seniors. More Amenities than you can imagine! *LOW HOA** no space rent. **ONE OCCUPANT NEEDS TO BE AGE 55+, THE OTHER OCCUPANT CAN BE 45+. **WHEN YOU OWN AT CHAMPAGNE VILLAGE, YOU HAVE THE LUXURY OF BEING ABLE TO RENT OUT YOUR HOME, if you chose. THIS IS A WONDERFUL BENEFIT (WHICH MANY SENIOR PARKS DO NOT OFFER) AND ALLOWS FOR GREAT FLEXIBILITY. ____PLEASE CHECK WITH THE OFFICE IF YOU HAVE QUESTIONS ABOUT PETS (HOW MANY AND WHICH TYPES ARE ALLOWED). ALSO: CHECK WITH THE OFFICE IF YOU HAVE QUESTIONS ABOUT GUESTS AND HOW LONG GUESTS CAN STAY. ____ATTENTION BUYERS WITH LOANS: ALTHOUGH THE HOMES ARE DETACHED PROPERTIES, THIS COMPLEX IS CONSIDERED "CONDOMINIUM" WHEN IT COMES TO LENDING. THIS IS IMPORTANT TO POINT OUT TO LENDER RIGHT AWAY. _____MONTHLY PAYMENTS: THE SEWER FEE IS SEPARATE FROM THE HOA FEE. ___ THE MONTHLY HOA IS $230.00 AND THE MONTHLY SEWER BILL IS $56.00 ___PLEASE CALL THE OFFICE OF CHAMPAGNE VILLAGE FOR MORE INFORMATION____ OWNERS AT CHAMPAGNE VILLAGE PAY THEIR OWN: SDGE (electricity), WATER, CABLE TV (if desired)), AND HIGH-SPEED INTERNET (if desired). ___ ATT is the most common carrier for internet and cable TV__ **Appraisers: please note - this complex is not a P.U.D., it is "condominiumized"** CHAMPAGNE VILLAGE IS LOCATED ADJACENT TO THE WORLD-FAMOUS WELK RESORT AND GOLF. Residents can pass through the North Gate and arrive direct into the resort for dining, shopping, golf, etc.